I have one of those clocks that beam a red number on the ceiling at night to let you know what time it is if you need to know. So last week I found myself waking up in the middle of the night for no apparent reason. I tried at first to keep my eyes tight shut, because once my brain knows the time it starts calculating how many more minutes or hours I have to achieve that maximum sleep we all need, more often preventing me from falling back to sleep out of pure anxiety about not sleeping. The day before I’d done the laundry, mopped the kitchen, gotten a good start on vacuuming the house, and faced another full day of classes the following day. After an interminable time I feel one eyelid slide open and glance at the ceiling. One seventeen. Ah geez! I’d barely managed to fall asleep before midnight as it was. I felt totally exhausted. Sometimes I wake up when I’m in the middle of a dream with a situation I’m unable to complete to my sub-conscious satisfaction. Then I remember what I’ve been dreaming, and spend a lot of time consciously trying to make all the pieces fit. I’d been dreaming about . . . zippers! And it was earth shattering! To fill in a bit , go back with me to the previous day when I’d selected a pair of cargo pants to wear which I hadn’t worn in a long time. The flap (or plaque) was on the right side, so it required either zipping with the left hand or twisting the right one awkwardly in order to manipulate it fully closed. Okay. With arthritis, I had to work at it a bit. Now, dammit, here I was in a dream still trying to zip it! That’s all it took. That one, rather long thought started my brain up from neutral (trying not to think in order to fall asleep), hurdled it right past first, then directly to second then on to third gear where I cruised along for the next three to four hours with questions swirling in my head. Were those men’s pants? Had I been wearing men’s pants all that time and only now noticed? By now I’m in full brain cruise mode. Who made zippers anyway? Why do most of my zipper flaps face left, but once in awhile face right? Makes more sense for right handed people, but there are as many right handed men as women. Do men’s zippers face the opposite of women’s? I always thought so, but I wasn’t sure now. The clock on the ceiling beamed on: 2:07. 3:17. 4:27. A.M. At this point my brain is totally stuck in zippers. Why had I not notice this disparity in zippers before? Actually I had a long time ago, but gave up on it because I didn’t have time to think about it. Plus it was a long time ago, before Google and computers had consumed my mind, and it was too much trouble to drive to a library to further explore it. Days later, after a Google check, I can now tell you that an electrical engineer, Gideon Sundback, was hired to work for the Universal Fastener Company. Good design skills and marriage to the plant-manager’s daughter Elvira Aronson led Sundback to the position of head designer at Universal. He was responsible for improving its predesessor William Judson’s far from perfect C-curity Fastener. Unfortunately for him his wife died in 1911, but fortunately for us, he threw himself into his work at the design table and by December of 1913, he had designed the modern zipper. 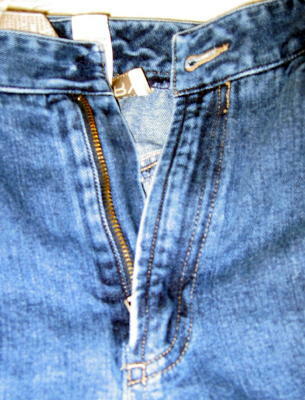 But with all the time, what little I had, devoted to the search, I never did come up with the question of whether men’s zippers always had the flap on the right and on women’s sometimes. Or did my cargo pants came from a discount store, thereby signifying a possible defect, account for my sleepless night? The last time I looked at the red numbers of the ceiling, it was 5:45. The next thing I knew, Hubby was calling me “lazybones” and admonishing me to get up. I looked at my watch, since daylight doesn’t allow me to view the red numbers on the ceiling. It was 8:34 a.m. We needed to be up and at ’em pronto! No more time to dream about zippers. Now that I’ve planted the idea in your mind, maybe you’ll continue the research. 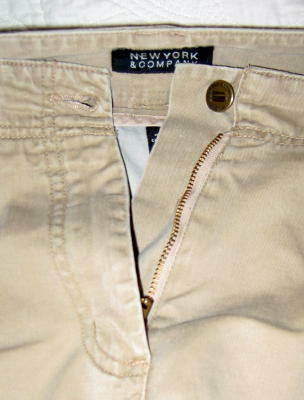 Why do men’s zipper openings face one way and women’s the other? Or is it a conspiracy to make me lose sleep? While you’re thinking on that, I’ll go on to a Google search on other subjects. Like Velcro maybe. Did some guy or gal by the name of Velcro invent that you suppose? This entry was posted in musing, Musings, Personal, Weird stuff and tagged google searches, losing sleep, zippers by Alice. Bookmark the permalink. Oh my, oh my……..I too have been waking up middle of the night lately. Zippers. I hate to tell you, but shirts button backwards for men and women too. I’ll go check google. Hmmmmmmmm the things we think of in the wee hours, I thought I was the only one who did stuff like that! Now zippers are one thing I have not found myself thinking about all night! Your post made me laugh even though I also sympathize because I’ve been there and done that … although I may have to get me one of those ceiling clocks. I have to raise up on one elbow and look over sleeping husband to see the clock and sometimes I just want to shake him awake so I won’t be alone. Don’t know about zippers. But I believe shirt buttons may have a story behind them. Back in the days when gentlemen would carry a sword, they usually sheath and carry it on their left waist. When they pull it out, they would use their right hand and cross over. So for people wearing right flap over left, the sword heel sometimes get caught when they pull it out. That’s why gentlemen usually tuck right-to-left because of necessity at the time. I suppose this fashion tradition carried on to nowadays and designers put buttons on the right side. I saw this on some history show. Don’t know if it’s true, but interesting nonetheless. I’ve never understood why men’s shirt buttons are on the opposite side of women’s blouses. Go figure. But truly, Alice…..don’t lose any more sleep over this! BY the way…..that clock would drive ME crazy! I need to have total darkness for sleeping. And a red beam on the ceiling would be too much for me. Maybe THAT’S what’s really keeping you awake! Paul, it certainly is good to hear from you, and thanks for sharing that history of the shirt. I did know that designers today place men’s buttons on the right side, but don’t give it a thought unless I’m wearing one of my husbands shirts. Feels awkward just as I’m sure the opposite would for you. Thanks for visiting after such a long time. Terri, you may be interested in a comment that came in just today from Paul. He shares the history of the shirt and why buttons are on the right side for men. Paul used to do an elderblog imparting his young but nevertheless insightful wisdom and I contributed to it once a week, but his career plans changed and I’m not sure what he’s doing now. We plan to see you next Monday in downtown Cedar Key! We’ll be either the oddest looking couple or the cutest couple. You decide. Edna, thanks for reading my nightmare. The night actually went pretty much as I wrote it. I suspect one of the reasons I couldn’t fall asleep again is that I kept writing the story in my head (do you do that?) because the more I lay there thinking about zippers, the more I was sure nobody else would be so silly. My mind works that way though. About the clock. It’s really great! Before I couldn’t read the numbers on the clock without my glasses on if I did wake up in the dark. Now even though the red numbers are slightly blurry I still see well enough to know what time it is. It wasn’t expensive either. I can’t remember where I got mine, in one of those stores you see in the mall with all those “needful” gadgets it it. It cost about $30 at the time, but I noticed them elsewhere sometime later for less. Isn’t that always the way? It also automatically adjusts itself to time changes, and I wouldn’t give it up for any amount of money. Darlene, I’m with you. I try real hard to think more on zippers, but I’m sure there’s some sort of logic behind it. Giving my thanks to Paul also. That’s very interesting about the men’s shirt buttons and something I always wondered about. See….you do learn something new every day! Awww, you guys will be THEE cutest couple, I’m sure! I can’t wait to meet you ONE WEEK FROM TODAY! This is so great! I’ve got my camera ready.